On the surface, the outlook for inflation this year appears tame. The consumer price index (CPI) registered a modest 1.5% in 2010, and the so-called "core" inflation gauge, which excludes food and energy, grew a mere 0.8%. But looks might be deceiving. Beneath the low CPI reading, the producer price index has been rising at a rate of 4%, and the costs of intermediate goods in the middle of the supply chain climbed by 6.5% in December alone. That wasn't an anomaly: The cost of intermediate goods floated more than 5% higher, year over year, in 11 out of 12 months, and it exceeded 6% growth in eight months, hitting a high of 8.7% growth in April 2010. Fed Chairman Ben Bernanke may well be correct about companies being unable to pass on higher producer costs, but he didn't address the skyrocketing costs of raw materials -- what the Bureau of Labor Statistics calls "crude goods." 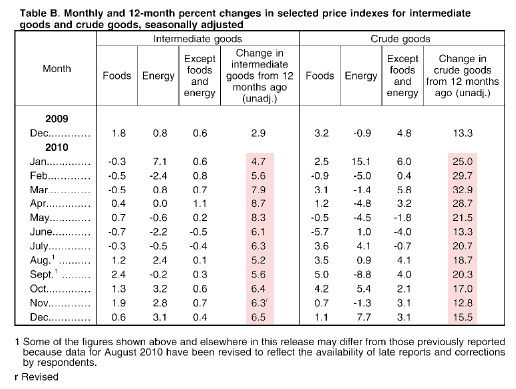 As this chart from the bureau indicates, the cost of these crude goods has grown by 15% or more throughout 2010, far above the 4% producer price index increase or the minimal CPI advance. The implication from these numbers is ominous. If companies selling finished goods can't raise retail prices, but the cost of raw materials and intermediate goods in the supply chain are rising by 15% and 6.5%, respectively, that means manufacturers' profit margins will become increasingly squeezed. It's basic math: If your costs rise but the price you charge customers remains unchanged, your profit margins shrink. And that's bad news for the stock market. The current market rally is based, not just on an improving economy but more specifically on rising corporate profits. Growing producer costs and raw-materials costs could crimp those profits, spelling trouble for the stock rally. In other words, the rising costs of basic and intermediate goods doesn't just threaten to burden consumers with higher prices, it also threatens to cut into the fat profit margins that have been driving the stock rally for almost two years. As if rising commodity and supply chain costs weren't worrisome enough, energy costs also are skyrocketing. Gasoline prices rose 8.5% in December alone, and overall energy costs grew a sobering 13.9%. Energy is consumed at every step of the global supply chain, so higher energy costs end up adding raising the costs for everything: grain, transport, manufacturing, chemicals, you name it. While bad weather is certainly the primary mover of grain prices, higher energy costs certainly aren't helping food commodity prices, which hit 2.5-year highs, triggering global protests. Insurance provider WellPoint's price increase of about 10% "reflects the fact that health care costs continue to escalate faster than the growth of premiums," according to a company spokesperson. Wellpoint reported a $130 million loss in its California operations last year. What Is Consumers' Real Inflation? 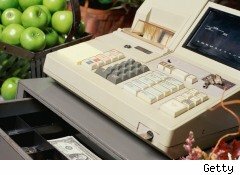 Consumers may be seeing their costs rise in other areas too. Aside from energy and medical care costs that are rising far faster than the official CPI suggests, another "big ticket" item for homeowners is property tax. As I reported here in December, those taxes are rising even as property values sag in most part of the country. In some places, other taxes also are growing. Illinois lawmakers made headlines by raising the state's income tax by 66% -- a move that will certainly inflate residents' taxes more than 1.5% in 2011. The possibility that the official CPI doesn't accurately reflect the reality of household expenses is more than just conjecture. Analyst John Williams, who publishes the price-tracking Shadow Government Statistics website, calculates that prices have flown north of 4%. Add up the data, and it looks like companies selling to consumers face an unsavory choice in 2011: either absorb hefty price hikes in energy, raw materials and intermediate goods and see their profit margins shrink, or try to pass on the higher costs to consumers and hope sales don't drop too drastically. Even if prices for those goods don't rise, consumers may find little to cheer about if gasoline, food, medical care and local taxes keep growing at double-digit rates.